Robin Bell Yoga is pleased to present “Healing Meditations”. 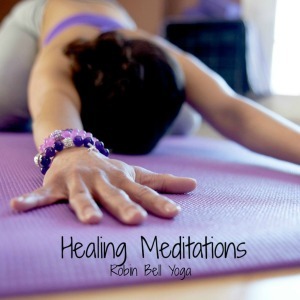 “Healing Meditations” include a 22-minute Yoga Nidra, a Chakra Balancing Meditation and two Biblical scripture meditations. Yoga Nidra is a systematic form of guided relaxation that reduces stress, promotes more restful sleep and promotes physical and psychological healing. Many students describe Yoga Nidra as a “super nap”. A regular Yoga Nidra practice is recommended for lasting transformative healing. Some people find it difficult to meditate on their own. These four guided meditations will allow you to easily receive the benefits of a regular meditation practice, in your own home.